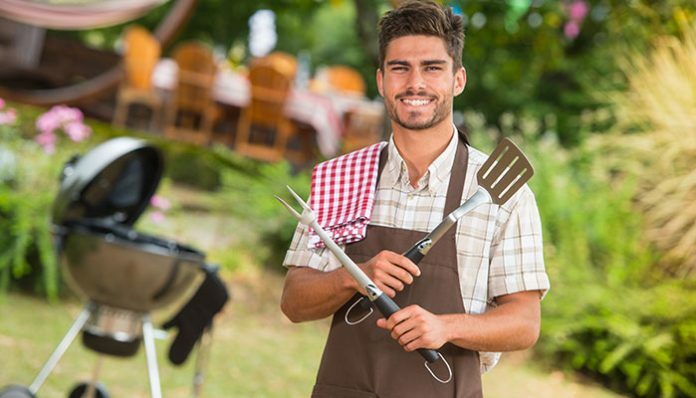 Summer is just around the corner and you’ve promised not to embarrass yourself before your avid griller buddies. Or maybe you’re just looking for a good recipe for a good glaze to put on your ribs. I’ve got your back, my friend. After this day, you’d no longer call a barbecue a grill. And next time you’re firing up your smoker, you’d know how to put that extra oomph into that smoking hot piece of meat. Today, here at Grills Forever, we will talk about the perfect glazes for the different types of meat, charcoal grilling techniques and all that is good and holy in the world of a grillmaster. There’s a prevalent misconception about grilling, even among some grill masters. They throw around the term “grilling” willy-nilly even when referring to barbecue techniques. Make no mistake, barbecuing and grilling are different. You might have been grilling for years, and might have been barbecuing for even longer; but unless you’re doing it without knowing the difference, you don’t know what you’re doing. Obviously, if you’re at this stage and reading on advanced grilling tips and techniques, it’s safe to assume that you’ve mastered the basics and know the differences well. However, we believe that it’s better to leave all the cards on the table before we move on to sharing our more advanced techniques with you. So, let’s look at the obvious differences between Grilling, Barbecuing, and Smoking (We’re not talking about pot). Grilling works by providing direct heat to the meat. The surface of the meat gets more exposure to the direct heat than the center or the other side. You flip your meat to get that even cooking and the perfect grill marks on either side. So, the next time you’re looking to ‘grill’, opt for grilling instead of barbecuing by keeping the lid off and cooking under open air. Barbecuing, in turn, is a slower cooking process. You limit the airflow by putting the lid on. In doing so, you’re trapping in the heat and smoke, getting a more even cooking. If you do it right, you won’t even need to flip that steak to ensure that perfect consistency. On the downside, you might not get those perfect grill marks. Smoking is a completely different technique altogether: You use wood chips or soaked pieces of wood to create a flavorful smoke to enhance the taste. Smoking, like barbecuing, is also done under a closed lid, but unlike barbecuing, is done under a lower temperature with a longer cooking time. Age the Meat – You can grill a piece of meat on your grill and if the cut is right, it is definitely going to come out tasting great. However, if you want to go an extra mile and really reel in the flavor, you need to get yourself some aged meat. Now, whether you like dry-aged meat or wet-aged meat is completely up to your personal preference. But we prefer that you go for an aged piece even if it weighs a little heavier on your wallet. Even if the worst comes to pass, you still can’t go wrong with a lump of well aged meat. Let it Settle – If you’ve just bought the meat from the cold section or pulled it out of your fridge, let it settle. Don’t shove it into the grill cold; otherwise, you’d end up with a charred outside and a raw center when grilling. Above that, you’re going to end up shocking the meat and end up with a tough and chewy product, even if you manage to get the correct level of doneness. It’s simple: If you want the meat to retain its juices and moisture, let it come to room temperature before throwing it into the grill. Estimate the Doneness – There are two ways you can know when your meat is done: First is from your experience. An experienced griller is expected to have an idea about when the meat is rare, medium rare or well-done. With experience, you will know how long you have to set the meat to cook before flipping it over. Second, you use the rule of thumb: literally. You press down your thumb on your palm and do it again on the meat to check for doneness. Refer to the image below for reference. However, the simplest and easiest way is to get yourself a meat thermometer. Why guess when you can know for sure? Just probe the meat with your thermometer and if the outer layer is hot and the center is cold, you’ve cooked it to a rare. But if the center is warm, it’s medium rare. Lastly, if the center is hot, it’s well done (although, it’s not recommended). Get a wired meat thermometer – you don’t need to keep poking the meat. Get the Grill Marks – Grill Marks might seem to be only an aesthetic detail on the meat, but it serves more purpose than just making it look good. Grill marks are a sign that the meat had been allowed to cook by itself without your interference and the meat had been made to set. And in order to get those perfect grill marks, you have to ensure that you flip the meat only once. Whether it’s a burger patty or a prime-cut steak, don’t fiddle with the meat too much. If you do, not only you’re messing up the grill marks, but also running the risk of squeezing out too much of the meat’s juices. Which brings us to the final tip. Retain the Juices – One cannot emphasize the importance of this enough when one is grilling. To get a perfectly grilled meat, you’re going to have to ensure that the juices stay inside. If the juices stay inside, it’s going to cook the meat from inside as well, reducing your cooking time drastically. Above that, it’s going to keep the meat tender and juicy, and when you bite into it, the flavors are just going to explode in your mouth. In order to not let the juices out, never use a meat tenderizer. That’s for beginners; we’re dealing with advanced grilling techniques for grillers’ eyes only. Don’t poke and prod your meat. Pressing down on it just to see your grill flare-up is a strict “no”. And leave your fork to yourself until the steak is on your plate, all ready to eat. And last, but not the least, salt the steak just before you grill it. Salt draws out the moisture from the meat. And when you’re barbecuing, you can’t keep opening and closing the lid every time you want to check the temperature, nor can you keep poking in and with your thermometer and leaking the juices. This is where the wired thermometer comes in handy. Just jab it in and let it sit. You can open and close the lid without interruption. There’s not much to be said about smoking that you might not already know. But if you don’t, feel free to check out our article for beginners, learn some charcoal grilling techniques and get some cooking experience under your belt, because you gotta first have skills to hone them. You should also have a clear idea on the different smoky flavors that different wood chips or chunks offer and which ones go best with which kind of meats. 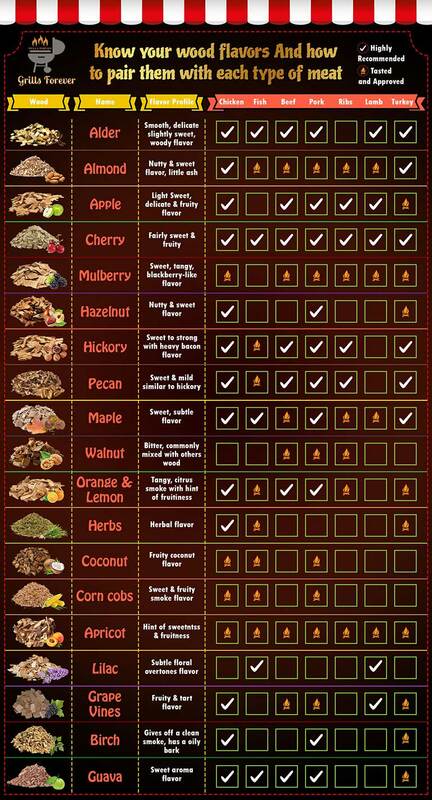 here is a wood chip selection guide to get the desired smoky flavor in your meat. Soak your wood chips beforehand and throw it into the charcoal in batches. It might seem like common knowledge at this point, but you’d be surprised at how many people ignore this step and throw them in at the same time. Soaking your wood chips for at least an hour is recommended. Soaked chips burn for longer and smoke better. And the longer the chips are soaked, the more flavor it can dissipate. However, if you’re using a pellet smoker, skip this step altogether. You don’t need to soak the pellets and the pellet smokers come with a built-in feeder tray that controls the rate at which the pellets are burned. Glaze the meat well. Whether you’re slow cooking a brisket or smoking a pork belly, you have to be generous with your glaze. Just glazing your meat will give you the taste you are used to and always like. But if you’re looking for that extra punch in the taste, you have to be liberal with your glaze. Brush them on at a specific frequency. If you do, even if the glaze is too charred, you’d still retain the taste and have a crisp outer layer. Patience is the key to get a lump of great smoked meat. Resist the temptation to remove the lid and check on the meat every now and then. Only remove it when necessary (i.e. Glazing and adding more wood chips where applicable). The less time you are spending with the lid open, the more time the meat is being smoked. Even after doing everything you can, you might end up asking yourself “Should I smoke it for an hour more?” or maybe “Is the grill hot yet?” In such cases, remember this golden rule: when the going gets tough, just wing it. Seriously, it’s that simple. Of course, there are many difficulties involved in the process of grilling and cooking, but barbecue is favored by us Americans because of its simplicity. You can put a meal on the grill and party with your friends while it cooks. Even then, we wouldn’t suggest taking it lightly and advise you to stick to the points mentioned above for the optimum taste. When it comes to grilling, a little goes a long way. Next articleEnjoy Sumptuous Barbecue and Grilled Dishes in the Comfort of Your Backyard!